Behind every artifact is a story that begins with an improbable dream. Before the 20th century, despite many attempts at building a flying machine, human flight appeared to be the most impossible dream. In 1909, Wilbur Wright described the general belief held before he and his brother made their success public: “When a man said, ‘it can’t be done; a man might as well try to fly’ he was…expressing the final limit of impossibility.” With their 1903 Flyer, the Wright brothers defied the common understanding of what was possible. This story—of a unique dilemma, an unconventional solution, and an unprecedented success—is repeated throughout the chronicles of aviation and space history and represented by the artifacts in the National Air and Space Museum. At this Museum, we celebrate ideas that defy. We tell the stories of people who defied preconceptions and of innovations that defied the odds. Denied flight training in the United States, Bessie Coleman moved to France to learn to fly. She defied a cultural barrier, and in the Museum archives is a copy of her pilot’s license—the first one earned by an African-American woman. In our Exploring the Planets gallery is a model of the Mars rover Curiosity, representing a spacecraft that, built to last almost two years, is now defying expectations as it continues its seventh year of exploration. NASA engineers had cushioned the landings of previous Mars rovers with airbags. The Curiosity team knew that the airbag method wouldn’t cut it for landing their heavy rover. Undaunted, they engineered the famous Sky Crane maneuver, a soft-landing technique to lower the rover to the surface, right onto its wheels. They join the stories of human gumption and effort that drive milestone achievements and inspire the next generation of innovators and explorers. With the 50th anniversary of Apollo 11 quickly approaching, I have been thinking about the sheer speed of innovation that occurred between Kitty Hawk and the Sea of Tranquility. We advanced from the Wright Flyer’s 12-second flight in 1903 to the Eagle’s landing on the moon in 1969. That rate of progress is possible only through a belief in ideas that defy the imagination. In today’s aerospace innovations, we continue to see ideas that defy. NASA’s work in sonic boom technology, which you’ll read about on page 58, is a great example. The sonic boom has been a major obstacle to commercial supersonic flight. But does it have to be? With its X-59, NASA seeks to modify the pressure waves produced by supersonic aircraft–effectively transforming a sonic boom into a tolerable sonic thud. Making supersonic flight practical for air travel will require more sophisticated engineering and new ideas—ideas that defy, which spring from the will to keep innovating. Behind every artifact we display at the National Air and Space Museum is a story that begins with an improbable dream. 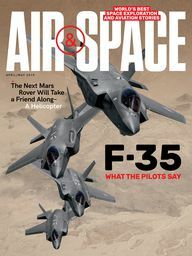 And that’s why I am excited about a new feature in Air & Space magazine, launching this month, to tell those stories. On the final page of each issue, “Ideas That Defy” will introduce you to artifacts in our collection that have achieved what we once may have labeled impossible. I hope you’ll join us in celebrating the daring, inspiring, and sometimes jaw-dropping Ideas That Defy. The Museum shares these ideas in our exhibits, programming, and digital media, and we invite you to share your own, using #IdeasThatDefy. Ellen Stofan is the John and Adrienne Mars Director of the National Air and Space Museum.